​St. 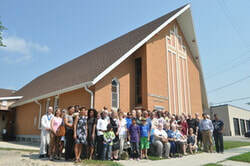 ﻿﻿Mary ﻿﻿Magdal﻿﻿ene is a﻿﻿n Anglican parish located in the heart of St. Vital in south Winnipeg. We're a welcoming group and we'd love to have you join us for worship. If you're looking for a friendly church home, we hope you won't need to look further after being here. Join us Sunday mornings at 10:30. Come early or stay after the service for coffee, conversation and fellowship. Our building is busy throughout the week as groups from within the church and the surrounding community make use of the facility. But the essence of church life is Eucharist Sunday morning. That's the time when you clear your mind of the cobwebs of daily life and cleanse your soul in the company of God. through Jesus Christ. You are welcomed with open arms here. Join us for services April 14 - 21.
coming up May 3 and 4. The Magdala News is now available. the 4th Sunday of the month. serve God the Creator here. The Parish of St. Mary Magdalene is part of the Anglican Diocese of Rupert's Land.